The lone "authentic" re-enactment of the weekend is played out in front of Christ Episcopal Church (703 S. Main Street facing Lions' Park) at 10 a.m. Sunday, May 5th. 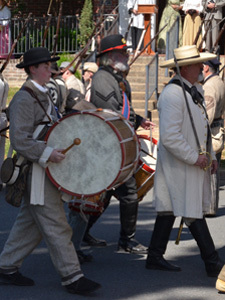 This year's re-creation marks the 158th anniversary of Fannie Benners' presentation of a hand-sewn banner to "The Jefferson Guards" a Confederate unit raised locally in 1861. 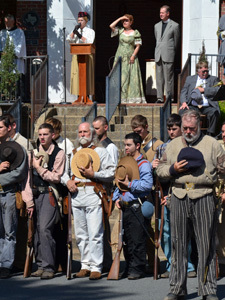 With troops at attention and roll called, Miss Benners' presentation is preceded by the reading of her moving letter, then followed by a musket salute from the troops. Coffee, donuts and juice is served afterward in the parish hall. This moving event is free of charge and all are welcome to attend the 11:00 a.m. Eucharistic service.